Professor David Goode, ecologist and naturalist. As Senior Ecologist at the Greater London Council (1982-86) and subsequently Director of the London Ecology Unit (1986-2000) he developed a major London-wide programme for biodiversity conservation which became a model for many other towns and cities. This programme was adopted by the Mayor of London in 2002 as the basis for biodiversity conservation in the capital. He was Head of Environment at the Greater London Authority from 2000 to 2004 with responsibility for producing the Mayor's Environmental Strategies, including Waste Management, Air Quality, Biodiversity, Ambient Noise and Energy. During this period he was instrumental in promoting effective policies for sustainable development which formed a crucial element of the Mayor’s statutory London Plan. 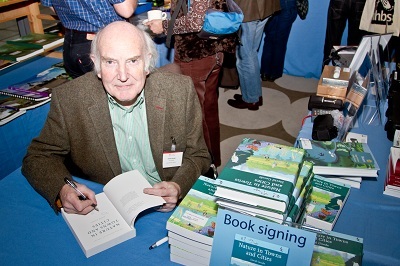 David at a book signing for Nature in Towns and Cities.